CAPE CANAVERAL — President Barack Obama's plans for NASAcould be "devastating" to the U.S. human space flight program and"destines our nation to become one of second- or even third-ratestature," three American astronaut heroes said Tuesday. 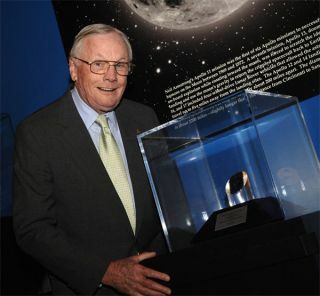 Neil Armstrong, who rarely makes public comments, was thefirst human to set foot on the moon. Jim Lovell commanded the famous Apollo13 flight — an aborted moon mission. And Apollo 17 commander Gene Cernanremains the last human to walk on the lunar surface. In a statement e-mailed to longtime NBC space correspondentJay Barbree of Merritt Island, all three took exception with Obama'splan to cancel NASA?s return-to-the-moon program, dubbed ProjectConstellation. They said Obama's plan to shift the responsibility forlaunching U.S. astronauts from NASA tocommercial companies would be a mistake and likely would take "substantiallylonger and be more expensive than we would hope." "To be without carriage to low Earth orbit and with nohuman exploration capability to go beyond Earth orbit for an indeterminate timeinto the future, destines our nation to become one of second- or eventhird-rate stature," the three said. The statement came just two days before Obama is scheduledto visit Kennedy Space Center to explain his vision for NASA. Not all former astronauts have come out against the plan.Armstrong's crewmate BuzzAldrin, the second man to stand on the moon, has endorsed the proposal,saying it will "allow us to again be pushing the boundaries to achieve newand challenging things beyond Earth." Obama's plan would extend International Space Stationoperations through 2020 and direct NASA to invest $6 billion in the developmentof commercial space taxi services for astronauts traveling to and from theoutpost. But it would kill Project Constellation and the Ares rocketsand Orion spacecraft NASA has been developing for six years at a cost of morethan $9 billion. "It appears that we will have wasted our current $10-plus billion investment in Constellation and, equally importantly, we willhave lost the many years required to recreate the equivalent of what we havediscarded," the former astronauts said. Armstrong,Lovell and Cernan all said the Ares I and Ares V rockets were patterned afterthe modular concept Werner von Braun employed for developing the Saturn 1B andSaturn V rockets that took American astronauts to the moon. The threeraised serious concerns about the idea of shifting the responsibility fordesigning, developing and operating the rockets and spacecraft flown by U.S.astronauts from NASA to the private sector. "Theavailability of a commercial transport to orbit as envisioned by thepresident?s proposal cannot be predicted with any certainty, but is likely totake substantially longer and be more expensive that we wouldhope," the astronauts said. "Without theskill and experience that actual spacecraft operation provides, the USA is fartoo likely to be on a long downward slide to mediocrity," they said. "Americamust decide if it wishes to remain a leader in space. If it does, we shouldinstitute a program which will give us the very best chance of achieving thatgoal." Published under license from FLORIDA TODAY. Copyright © 2010 FLORIDA TODAY. No portion ofthis material may be reproduced in any way without the written consent of FLORIDA TODAY.